I have been debugging the Remote persistence we use for ECO6 – this uses WCF. It was Jonas that started this work and he did a fine job – but we have a few gotchas that I want to get documented here. If you build your own server (Remote persistence server for ECO), either as WindowsService or as a WinForm application (both available from the ECO VS Wizard) we use the WCF class ServiceHost. In this ServiceHost we set some parameters – like what binding to use and so on. During the beta-phase of ECO6 it became apparent that we also needed to set a lot of other values like MaxReceivedMessageSize and MaxBufferPoolSize etc on the Binding object. The gotcha with this is that if you host your Remote persistence server in IIS – we do NOT use the ServiceHost because then IIS IS provides the ServiceHost for us. So in this case we need to tune up the MaxReceivedMessageSize and MaxBufferPoolSize etc some other way : web.config. The green line is the name of your service – this is the name of your subclass of the PersistenceMapperProvider. Another thing that got us stumped for a good 30 seconds was the unexpected server shutdown when trying to transfer types used by modlr-attributes over WCF when these types were not known to the service. This is common place when you do your own Enumerations for example or any other handy attribute-type you might want to use. You need to tell the WCF service about these types before the service is started. And you need to tell the client AND the server. This will give you a file with a lot of information at c:\temp\WCFTracelog.log. Very nice. Now I see the configuration is as in a classical WCF-Service with IIS-Hosting, everything is explicitelly declared. 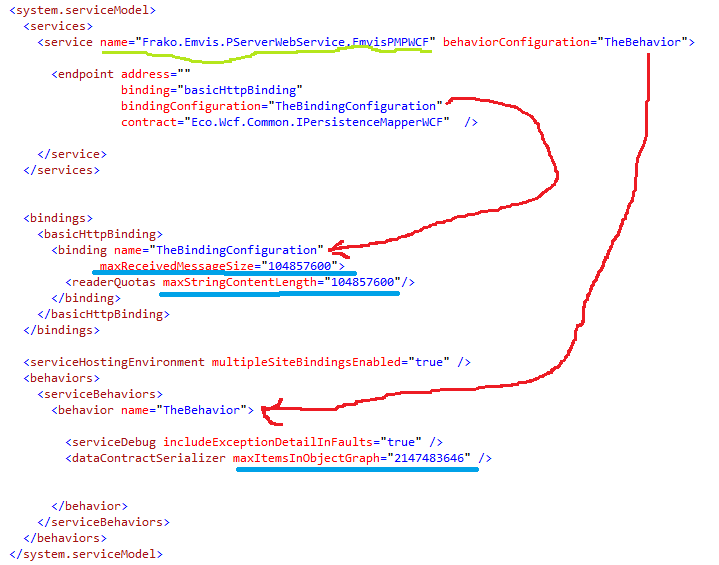 The Service Contract is explicitelly referenced in endpoint definition ("Eco.Wcf.Common.IPersistenveService"). Does it give us developers the possibility to extend it with our own OperationContracts, e.g. by subclassing the interface and implementing new methods in the derivate of PersistenceMapperProvider? If not what approach would be the best to write own WCF Services under ECO? If you want to communicate with your server for other reasons than for Persistance mapping the most logical solution is to define another service. This new service implements another contract that you define yourself. Your server can expose multiple services so there is not need to trying to extend this one. I think I need to specify transferMode for BLOB field to work properly? How to use another Binding? I added a new post detailing usage of other bindings. This new post requires new ECO build. Thanks for this Hans. I forgot to re-Add my connection string after copying a new persistence server app generated from the templates into my project. That yeilds total darkness! 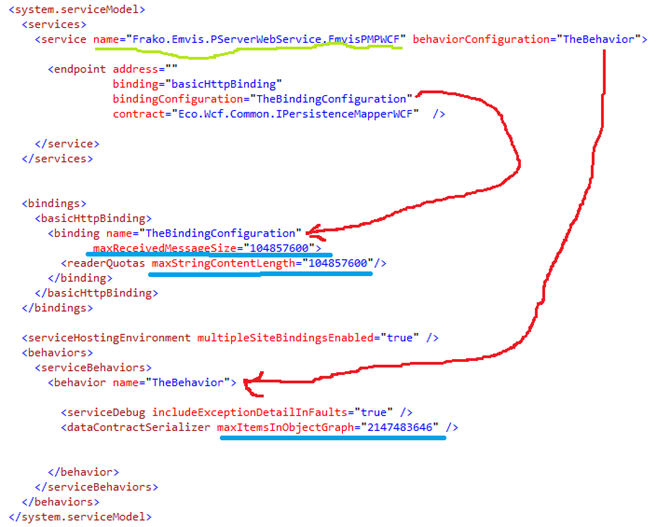 One thing you could do is be clear whether you are talking about app.config, web.config or both in the configuration details.